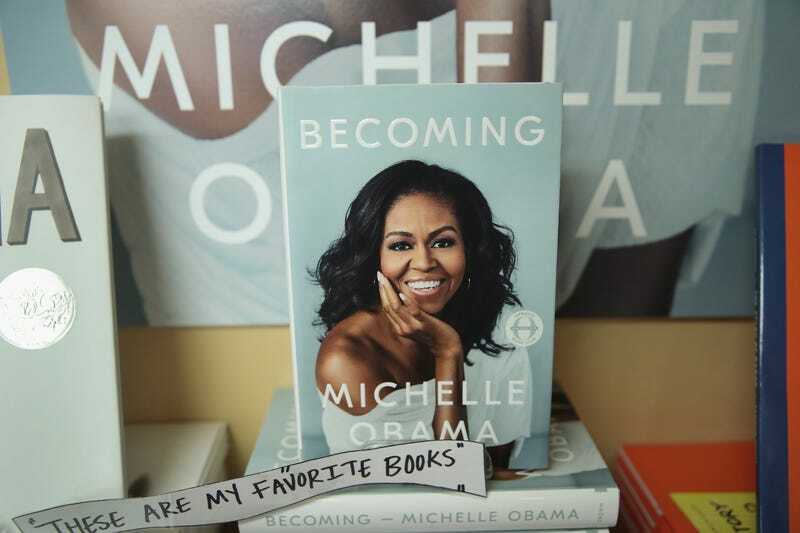 Becoming, by former first lady Michelle Obama, is displayed at the 57th Street Books bookstore on November 13, 2018 in Chicago, Illinois. Okay, so you didn’t cop those tickets to Michelle Obama’s epic multi-city book tour ... or, you opted out, because you hate crowds and high-priced tickets to events where you have no chance of being near the stage or retaining the magic of the experience beyond 24 hours after it ends. But still, you love our former forever first lady, love her first book, Becoming, and would love to have just a little something to commemorate the occasion ... preferably, something machine-washable that comes in sizes Small to 2XL. Well, in keeping with the magnitude of a nine-city stadium tour, Obama comes with a 21-piece line of tour merch—and you don’t have to be there to get it. Captioning some of her most inspirational quotes, Michelle Obama’s Becoming merch collection ranges from $10 to $65, and includes apparel, mugs, totes, a hat, a journal, and even a set of enamel pins. Frankly, the idea of wearing a Michelle Obama-branded sweatshirt sounds about as close as we’ll get to one of her famous hugs, but most important, all net proceeds from her merch sales will be donated to Obama initiative Global Girls Alliance, which promotes and supports girls’ education around the world. Wondering about the offerings? We’ve compiled them for you below. But at cost-per-wear for a good cause, one of these items may be an investment on par with the book itself (and will likely get more use, in the long run).